Writing can be a very enjoyable and rewarding process. However, if you’re writing with the goal of becoming a published author or as an option for a career it can become overwhelming, to say the least. Productivity is key to obtaining any goals but especially when you’re inundated with projects, dates and deadlines, contests and conventions. Not to mention the incredibly hard process of producing a publish worthy manuscript. After these first few months of writing and immersing myself in the world of Social Media I’ve noticed that less things have been getting done. Less writing, less family time. I seemed to be doing a lot of work but getting no where close to accomplishing what i set out to accomplish. So I went out in search of tips and tricks on how to be more productive. The following 6 steps are what resonated the most with me and my situation. I hope this helps others in the same boat as me. Use a notebook or pad of paper and track what you do for 1 whole day (do a week for a better picture). Write down everything you did and the time you spent doing it. I know, this sounds tedious and kind of silly but it’s honestly the best way to see where you are wasting the most time and what you can change, schedule wise, to make the most of your day. Have a designated work space (if at all possible). Use a spare room or even carve out a little nook in a corner or a closet. Check Pinterest for Ideas. No excess supplies or materials cluttering up your space. Be ruthless in your decisions. Keep only what is absolutely necessary to get your work done. No loose papers lying around. Scan all loose papers(bills, receipts, business cards, articles, notes, etc…) and place it in a digital file on your computer. If you want to keep the hard copies of everything you scanned, buy magazine holders, decorative boxes or file folders then categorize, place, and store them all according to subject. make your area as pleasing to your eyes as your budget will allow. You want your space to evoke a sense of calm and inspire you. Make a business plan that lists your short-term and long-term goals for your writing career. Don’t be shy, reach for the stars. You wont be held accountable for not meeting each goal. It’s just a good exercise to do so that you have an idea of what you want out of your career and how far you want to take it. 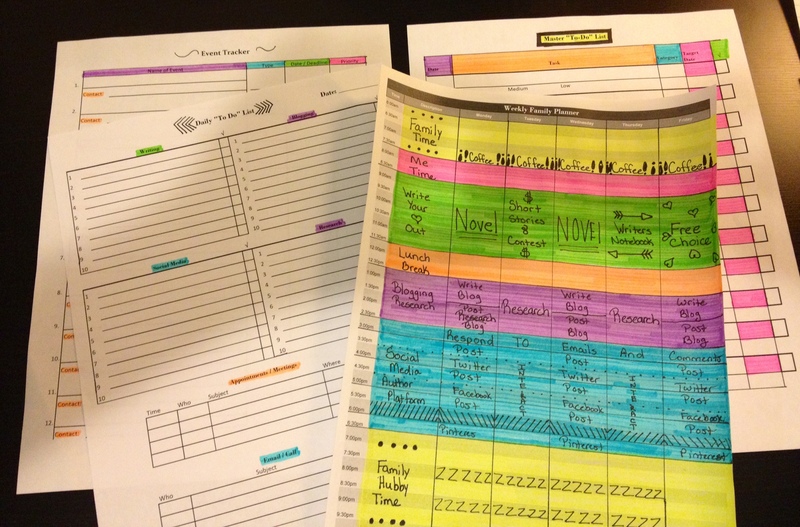 For those with a blog, invest in a good blog planner, make one of your own, or print one off from the internet. It will help immensely in keeping all your blog ideas/projects in line. Lists are your friends. Honestly. I know some of you like to fly by the seat of your pants and leave everything up to chance but things can fall through the cracks like that. With the market so full of writers, who’s more likely to get the job? Someone who takes the time to make lists and knows just what they need to accomplish and when or someone who goes with the flow and works on projects when inspiration strikes them? I confess, I like making lists and I use a lot of them. You don’t have to use all these lists I’m about to throw your way but at least choose one or two. Master “To-Do” List: This is a list where you will keep all upcoming tasks, projects (little and small) and personal projects you want/will work on for the year (or month if you are a really busy writer). It’s also good, for the larger projects, to break down the project into steps and set end dates according to their deadlines. Figure out the priority level for each item listed and state it so that you don’t forget. Daily “To-Do” List: This is a list where you will keep track of (fill out) all your daily tasks in regards to your writing career along with any appointments, meetings, important emails and calls that will need to be taken care of for that day. You should fill this out the night before so that when it comes time to work you are ready to go. Weekly Schedule: This is a sheet that lists the time of the day on the left side in half our increments and the days of the week on top. Take the notes from the day (or week) you observed yourself and decide how much time to devote to each task you will need to perform each day (example: Writing 3hrs, Blogging/Research 2 hrs, Social Media 3hrs, etc…) It’s helpful to color block the times to easily recognize what you are seeing when you glance at the schedule throughout the day. (I also like to put this list in a picture frame so that I can write (with a dry erase marker) on the glass certain “one time only” tasks that come up. This way I only need to print and fill out this list once. Don’t forget to carve out time for eating, family time, and “me” time. A helpful tip is to use a timer and set it to the amount of time allotted for the tasks. That way you don’t accidentally run over. Event Tracker List: This is a list where you will write down all the upcoming events, conventions, workshops, parties, meetings, and contests you will to attend or even just wish to attend. Any info you enter here should also be entered into your calendar. The list is just an easy reference when you’ve only got enough time for a quick glance. Check over/fill out at the beginning of each month to keep it up to date. Keep your email inbox clear at all times. When you get an email read it and respond then put it in its designated online email file folder. If you don’t have the time to respond, set up a reminder or use a service the sends the email back to you at a time you choose. Set time aside in your daily schedule to devote to reading your emails, responding to them, and writing/sending out your own. Having a designated time to make your calls is also helpful. However that all hinges on the person you are calling being available when you want them to be. Write all important emails/calls that you need to do on your Daily “To-Do” list so you do not forget. Or set a reminder on your phone. An App that plays White noise, brown noise (yes it’s a real thing) pink noise (I kid you not) or nature sounds. Music from movie soundtracks (I love this option because when I listen to a movie soundtrack while writing a scene it will affect it in unexpected ways that in the end creates something incredible. We’ve covered this already in other steps but it bares repeating. No Internet use (Social Media, favorite websites, games) unless it’s the time you’ve designated for it. No phone/cell phone. This is probably THE most important rule. If you can, turn off your phone completely. I don’t know about you but when I switch my phone to vibrate only, every time it buzzes I have to stop what I’m doing to see what the buzz was for. Then I end up getting sucked into all my fun phone apps and waste valuable time. If you can’t turn off your phone completely (like me) your cell phone might have a function where you can block all incoming calls except for certain numbers you choose. I like this function because I need my phone on in case my husband or my kids schools call but other than that everyone else can wait. Dropbox – A program you can use to sync all your documents, images and videos to all your devices. E.ggtimer – A program that turns your computer screen into a simple timer where you can set the time. (You can also minimize the window to be able to work on the computer at the same time) This is helpful for those of us who, if using our phone for this option, will undoublty waist time playing with them when we need to touch them. Evernote – A versatile program with lots of little features that lets you store and keep track of any and everything. GoogleCalendar – A calendar that you can update on your computer or any other device that has the Google app. The best part about this is you can have multiple calendars and you can choose to easily share it with whomever. GoogleDrive – A program that lets you upload all important documents , create documents and share documents. GoogleTasks – A program that lets you create task lists and share them. Notes.io – A program where you can write down from articles or classes and share. Otixo – A program that will allow you to be able to access all your online files with a single log in. PrintWhatYouLike – A program that takes a page full of adds and images and lets you print just the text that you need. SugarSync – A program that helps you backup your computer files and lets your share between devices. *Remember* Life Happens When We Are Busy Making Other Plans so don’t be a list/schedule Nazi. Make them and use them as a guideline to help you be more productive with your time but be flexible for when life throws a curve ball at you. Do you have any productivity tips or tools to share? Don’t be shy, comment and let me know or contact me. I would love to hear from you. 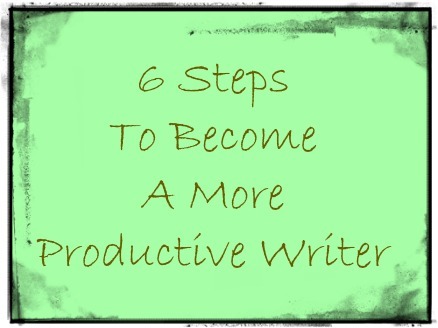 This entry was posted in Writing Resources and tagged Planning, Productivity, Schedules, Time Management, To-Do List, Writers, Writing. Bookmark the permalink.